I have two gorgeous 2 year old Burmese cats. I would like to get them used to travelling in the car, as they are leash trained and we would like to take them on weekend trips with my husband and I. Do you have any suggestions fo getting them used to car travel? Cats are not known for being the best travel buddies, unlike our canine companions. 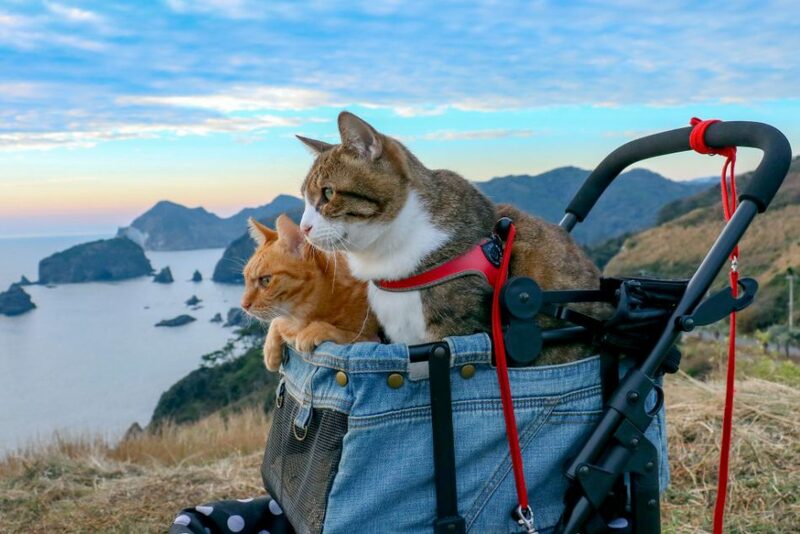 But it doesn’t mean that all cats don’t like to travel. There are many cats around the world that travel with their people and share their journey on social media too! But cats do get used to a routine, and they are usually content in a calm and stable environment. So how do you get them used to the car, its movements and how to choose the right containment for them too? Cats are truly remarkable creatures. They can surprise you in unexpected ways, and taking them on adventures is one of them. They are very observant, they love a good romp around in nature, and they are still easier to maintain on a journey than a dog (sorry dog lovers, but it is true!) The best way to set up car travel for your cat is PREPARATION. Your success in traveling with your cat starts with a lot of preparation at home before you even hit the road. If your cat is not microchipped, then it needs to be done immediately. It can be done at your vet via a needle, and there is almost no pain. A microchip will contain a serial number that is allocated to your cat and linked to your contact and address details. This is crucial if your cat is an outdoor cat, and if you are taking them on long travels. A collar can sometimes come off, but a microchip ensures people can locate you if you lose your cat. If your cat is already microchipped, check with your local council that your details are up to date. Ensure that all databases that have your cat’s microchip number are updated. Many of my clients have lost their cats only to find out their details were not updated across the board. Your cat must wear a collar if you are taking them out of the house. Whether it is a trip to the vet or going on adventures, they need a collar with a tag. Yes your cat may keep taking it off, but always have a spare. As much as this can be useless, it is so important for your cat to be wearing a collar. 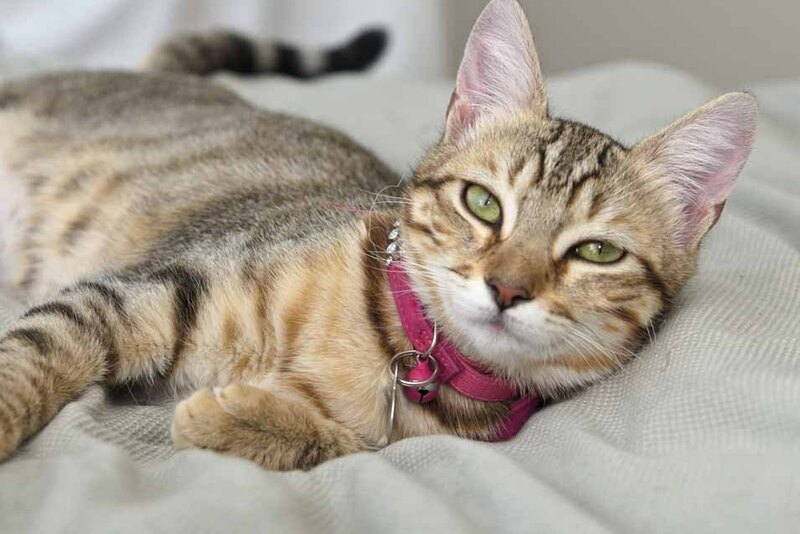 If your cat is lost, your cat is more likely to be returned to you if they have their collar than without. A lost cat will look more like a stray cat walking around without a collar, so people will be less likely to try to find the owner. Don’t risk it! IS YOUR CAT CRATE FRIENDLY? For many people, the only time their cat goes into a carrier or crate is to the vet. Some people don’t even use a carrier, they will hold their cat tightly in a towel from home, in the car and to the vet door. Getting your cat used to a carrier or crate is vital to their safety, and yours in all situations. Not only it is crucial for trips to the vet or travel adventures, you will need to crate your cat in the case of an emergency such as a fire or a natural disaster. You want to make sure your cat is safe. It is quite simple and easy to get your cat used to a crate. Simply leave it in the middle of the common room in the house such as the lounge room or office, and keep it open. You can lay a soft towel, possibly add a toy in there to catch their interest. Make sure the door is open and secured so your cat does not get trapped in there when you are not home. 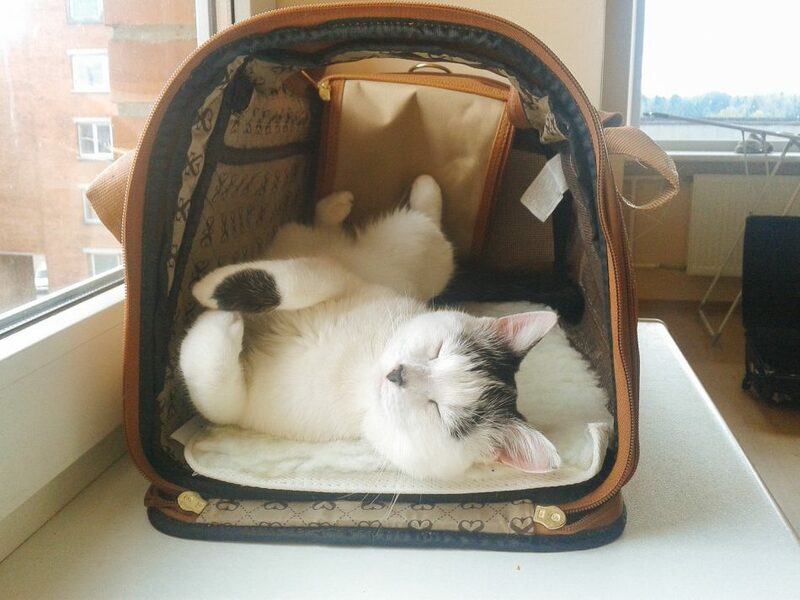 Your cats will get curious and have some fun exploring and messing about in the carrier. If you need to fast track adapting your cats to the crate, you can simply feed your cats meals near the crate, and then slowly move their food inside the entrance of the carrier. At each meal time, move it further inside the carrier, until your cat is completely inside. Let this happen for a few meals, and then get your cat used to closing the door on them whilst they are eating. Close and open the door a few times until they are comfortable being in the carrier with no issues. This crate needs to be seen as part of the house and your cat’s routine. If you are taking your cat for short trips, you may need to just prepare for unexpected accidents. But if you are planning long travels with your cat, then you will need options. How do you ensure your cat can go to the toilet when they need to? It all depends on your cat – can they go in nature, do they need a litter tray only- or will they hold it til there is a longer pit stop. It will depend on your cat, but we do need to have some options for them. There are cat carriers that come with a built in litter tray. Make sure it is the same litter you use at home. You can also have a portable litter tray for your cat to use outside of the carrier. Granted you will have one for their accomodation, but you can use a small portable one that can be placed in the footrest of the car or in the boot or hatch if your cat wishes to go during a break. If you are fortunate enough to have a leash trained cat, its possible they will do it outside in nature. As you know cats are very curious creatures. They love to explore, sniff and get into things just as much as other animals. This is the best way to get your cat used to the car – its smell, the sounds, what will happen regularly in there too. If your car is in a garage, make sure all doors are closed before bringing your cat to the car. Then let them climb in, and have a good look around. They will sniff, investigate hidey holes, and look out windows. Once they have settled, you can turn on the car. Let them get used to the sounds – the initial sound, the accelerator, the indicator sounds, and of course if there is any acceleration! Repeat this routine several times before your trip – practice with your cats in their carriers too as they will spend a lot of their time like this on your trips as you travel along. Putting some treats in the car will also create a positive vibe about the car. 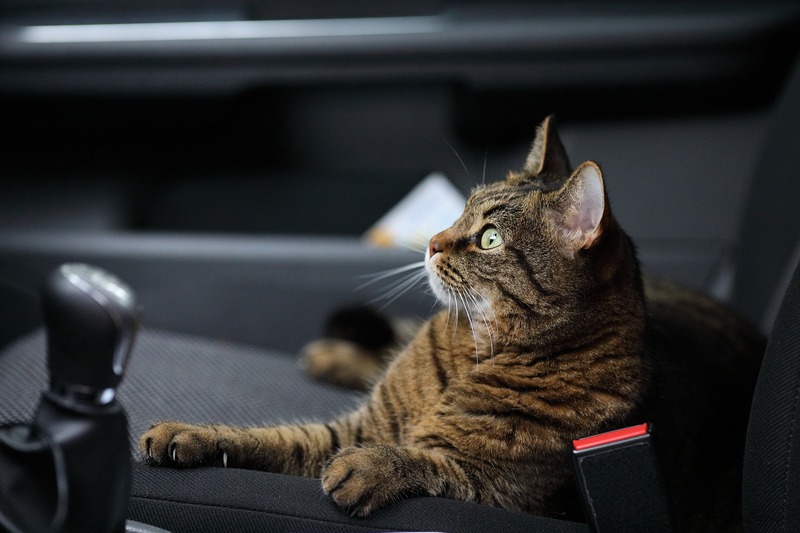 Often we unassumingly take our cats straight into the car to the vet or other places without realising a cat’s instincts does not prepare them for a car. This is also the same for many other animals that are not used to the car, and unless they have been desensitised from a kitten or puppy age, many animals can get nervous or motion sickness in a car. It is worthy to state that you should NOT let your cats roam around your car whilst you are driving. Whether you have someone with you or not, any sudden movements or jumping around can distract you as the driver and can lead to accidents. It can also cause your cat serious injury if you stop suddenly. Keep you and your cats safe when you are traveling. If you need to let your cats out of their carriers after a long time of travelling, or they need to use the litter tray, pull over and turn off the car. Ensure your windows are all closed too before letting them out! Start with short trips in the car. Don’t leave it to just going to the vet, otherwise your cat will associate car rides with unpleasant visits to the vet only. Take them for short rides to the park, or around in your local area. Get them used to the idea of being in the car. For your more adventurous cats, go for a ride, and then pull over and stop. Let them out in the car so they can see their surroundings. This gives them a better idea of what to expect going on journeys with you. Cats are habitual creatures, so doing these little trips help them to adapt to their environment and all that they are going to experience. If you find your cat is experiencing motion sickness, you can talk to your vet for remedies to help reduce it. Some cats are more sensitive than others, so you can try some natural remedies such as Flower Essences to help calm their nerves. There is a great big world out there for your cats to experience – with the right preparation and training, you can certainly set your cat up for some exciting adventures with you. As always, cats will always surprise you with what they can handle, and ultimately we know you want to give your cat the best life possible. They give you so much love, devotion and joy – it only seems right to return the favour, right?